Oil Grisaille on Canvas - 6x6"
After transferring the outline sketch to my canvas I mixed a string of gray scale values using Raw Umber, Ivory Black and varying amounts of Titanium white to get a range of 7 values. 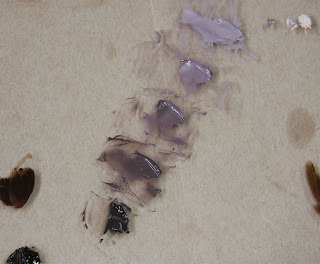 My value 1 is straight titanium white and my value 7 is a 2:1 mix of Ivory Black and Raw Umber. I really enjoyed this exercise and using a simple subject really allowed me to focus on modelling the form without getting caught up in the details.